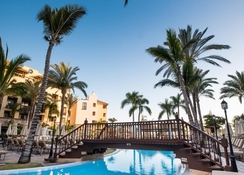 Located in the swanky city of Costa Adeje, the GF Gran Costa Adeje is a luxurious five-star property favoured by all kinds of travellers. With a constant temperature of 25°C and bright sunshine all year round, there couldn’t be a better place for fun in the sun. Modern facilities, warm hospitality and an array of guest-friendly services makes this hotel the perfect retreat. The hotel’s close proximity to the beach and other attractions appeals to travellers. 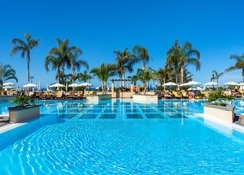 The Gran Costa Adeje features massive outdoor pools, well-appointed rooms which allow guests to relax amidst unparalleled luxury and fabulous views of the beach. The hotel’s restaurants serve delicious cuisines from around the world. Guests can also unwind at the pool bar. 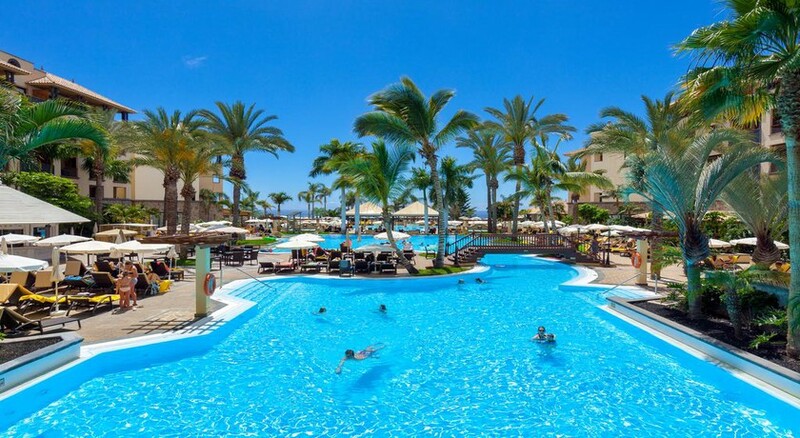 Positioned barely 500m from the popular beaches of Duque and Fañabé and in close proximity to several tourist attractions, the GF Gran Costa Adeje is the ideal resort for any type of vacation. Siam Park, the largest theme park in Europe, is just a few minutes’ drive from the property. The Tenerife South Airport is about 19km from the hotel. The GF Gran Costa Adeje features 458 luxurious guestrooms. These guestrooms are categorised as —Double Room, Double Room with Sea and Pool Views, Accessible Room, Senior Suite, Royal suite and Imperial suite. All rooms are furnished with en suite bathroom, plasma TV with satellite connection, a la carte minibar, bathrobes, hairdryer, safe deposit, direct telephone, 24/7 room service and a furnished balcony. There are special rooms for handicapped guests. 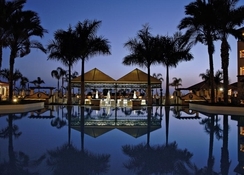 The GF Gran Costa Adeje features three restaurants and four bars. The La Finca Buffet Restaurant can can accommodate up to 600 diners, while the La Laja Restaurant lets you savour lip-smacking food in a cosy atmosphere. Both restaurants serve local and international dishes as well as alcoholic and non-alcoholic beverages. Both restaurants have a strict dress code – casually dressed guests in shorts and beachwear will not be allowed. Head over to the Pool Snack Bar for refreshing drinks as well as delicious snacks whilst relaxing on the sun loungers. Similarly, the hotel also features a Hall Bar, a Juice Bar and an adults-only – Ático Bar. There are several sport, entertainment and leisure opportunities here at the GF Gran Costa Adeje. The 1500 metres of pool area in the hotel comprise a main pool, terrace pool, aqua gym and children’s pool. A huge solarium surrounded by mats, shades, loungers and tropical gardens is adjacent to the pools. Guests who wish to stay active during their vacation can do so at the gym. Guests can also take advantage of the tennis court, paddle court, squash court, basketball court, football pitch, table tennis, pétanque area, billiards and mini-golf. Kids too can have fun at the mini club, which arranges for entertainment while the parents take a relaxing break. Wonderful resort. Does what it says on the tin. Hotel was brilliant, will be back next year. Excellent hotel. Wonderful entrance which sets the tone for the hotel as a whole. Will definitely be returning. Well done ! Not the perfect location but we could return in due course. Food of a very high standard with plenty of choice. Facilities were good and the evening entertainment was of a high standard. On balance not sure if the hotel is a true five star hotel but we feel that the management are striving to improve many aspects of the hotels facilities. Stayed here in August with partner and daughter and had a wonderful stay,when we arrived we had welcomed drink and even got an upgrade on our room to top floor right in the middle,was perfect.The pool area was great,my daughter loved it. Overall we had a lovely stay and would definitely recommend this hotel. The hotel is very well situated with own parking, heated swimming pool, another pool, including on the roof and very nice all-inclusive restaurant. The food in restaurant is very delicious and the choice is wide enough, but was reduced slightly over the years. Also the hotel facilities are already slightly worn and look a bit old. The evening entertainment is suitable for children and elderly, but not for young and mid-age adults. One well noise-proof in-house night club with dance music, working till late would be very beneficial. The staff is a bit rude and non-English speaking, but not so annoying, as somewhere else. Overall good 5-star hotel with quality of 4-star one, but still worth to stay in at good enough all-inclusive prices.